Oscar de la Renta, 24 karat gold plated ring, $195. 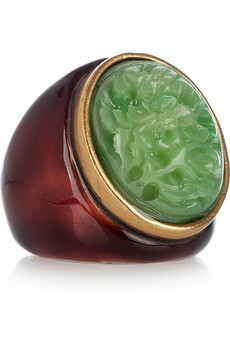 We love this Oscar de la Renta cabochon ring because it is organic enough to stand alone. It is the perfect complement for those who love to mix and match and who favor bohemian and hippie styles. It can easily be worn with any outfit and make a statement on its own which is great for easy summer dressing.